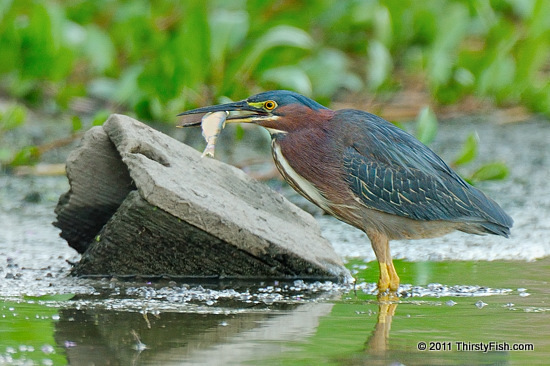 The Green Heron is a small, stocky heron native to North and Central America. It mainly eats small fish, frogs and aquatic arthropods. We, the pompous human species, used to think that animals were automatons - self operating complex machines. We thought that they were not sentient. We thought that they were not capable of empathy let alone altruism. We thought that they could not use tools. We were wrong! The Green Heron is one of the known species that uses tools. It is known to drop food, insects, or other small objects on the surface of the water to attract fish. Certain species of gulls are also known to use tools. Yes animals are like us, but, in essence and in effect, we are more like them! We overstate our human characteristics. Proof? Just observe the people around you.